More should be done to win confidence of exporters - Ramal J. With the implementation of the National Export Strategy (NES), much work is left to be done in terms of winning confidence of the export community said Ramal Jasinghe, immediate Past President of National Chamber of Exporters (NCE) of Sri Lanka. “NCE is now engaged as a participant to the implementation process of the NES, with seats on the Advisory and Working Committees.” Jasinghe told at the 17th Annual General Meeting of NCE, held at Galadari Hotel, Colombo. He said that Chamber was continually in the forefront raising concerns of exporters related to the negotiations of the proposed Free Trade Agreements (FTAs) with larger countries who enjoy greater economies of scale, to mitigate difficulties to enter their territories due to non-tariff barriers, non-recognition of quarantine and laboratory test reports of Sri Lankan institutions, country of origin requirements, and items included in the negative lists which impact Sri Lankan manufacturers. “However the Chamber recognizes the need to reach a wider global customer base through FTAs or a similar mechanism, to achieve inclusion to the global market place, on fair trading terms. “he said. With the real possibility of the GSP concession eventually being withdrawn to the growing Middle Income Status of the Country, emphasis on the export of Services would attract more focus of the Chamber. “Having made positive through the initiatives of our ICT cluster, we recognize as a sustainable way forward the need to add on more service providers earning foreign exchange to augment the service sector portfolio of the Chamber, such as education , Tourism and Professional services, to develop a robust export economy.” he said. He also stressed Sri Lanka’s competitor countries in the region such as Pakistan, Bangladesh, Vietnam, Cambodia, have overtaken Sri Lanka in apparel exports sector this year by a wide margin due to their gains during the period where Sri Lanka lost GSP+ benefits, with total exports from Bangladesh which is categorized as a least developed country reaching US$ 40 billion. 2018 දෙසැම්බර් 19 දින සිට 2019 ජනවාරි 16 දින දක්වා කාල පරිච්ඡේදය තුළ දී රුපියල් මිලියන 30,990 ක විදෙස් ආයෝජන, රජයේ සුරැකුම්පත් වෙළෙඳපොළෙන් ඉවත් කර ගෙන ඇති බව වාර්තා වේ. ශ්‍රී ලංකා මහ බැංකුවේ නවතම වාර්තාවකට අනුව 2019 ජනවාරි 16 දිනට පවතින රජයේ සුරැකුම්පත්වල විදෙස් හිමිකාරීත්වය රුපියල් මිලයන 145,450 ක් ලෙසින් සටහන් වන අතර මෙය 2018 දෙසැම්බර් 19 දින වන විට පැවතියේ රුපියල් මිලියන 175,440 ක් වශයෙනි. මේ අතර 2019 ජනවාරි 16 න් අවසන් සතියක කාලපරිච්ඡේදයක් තුළ දී රජයේ සුරැකුම්පත්වල විදෙස් හිමිකාරීත්වය රුපියල් මිලියන 154,202 සිට රුපියල් මිලියන 145,450 ක් දක්වා රුපියල් මිලියන 8,752 කින් පහළ ගොස් තිබේ. 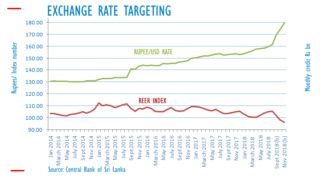 Sri Lanka's real effective exchange rate (REER) index has dropped below 100 amid a collapse of a soft-peg with the US dollar, forcing the central bank to spend 1.2 billion US dollars to prop up the currency while printing money. ඊයේ (22) දින පැවති DFCC බැංකු සමාගමේ අධ්‍යක්ෂ මණ්ඩල රැස්වීමේ දී හිමිකම් කොටස් නිකුතුවක් සිදුකිරීම සඳහා නිර්දේශ ලැබී තිබේ. රුපියල් බිලියන 7.63 ක ප්‍රාග්ධනයක් සම්පාදනය කර ගැනීම වෙනුවෙන් මෙම හිමිකම් කොටස් නිකුතුව සිදුකිරීමට නියමිතය. ඒ අනුව කොටස් 106,039,075 ක්. එකක් රු. 72.00 බැගින් නිකුත් කිරීමට සැලසුම් කර ඇති අතර මේ සඳහා සමාගමේ වත්මන් කොටස් හිමියන්ට ඉල්ලුම් කිරීමට අවස්ථාව හිමිවේ. එහිදී සමාගමේ වත්මන් කොටස් හිමියන්, සෑම කොටස් 5 කටම කොටස් 2 ක් බැගින් වන පරිදි ඉල්ලුම් කිරීම සඳහා සුදුසුකම් ලබනු ඇත. මේ සඳහා කොළඹ කොටස් වෙළෙඳපොළෙන් සහ අති විශේෂ මහා සභා රැස්වීමක දී සමාගමේ කොටස් හිමියන්ගෙන් අනුමැතිය ලබා ගත යුතුවේ. මෙය සමාගමේ Tier 1 ප්‍රාග්ධන මට්ටම ඉහළ නංවා ගැනීම වෙනුවෙන් කරනු ලබන හිමිකම් නිකුතුවක් බව බැංකුව වැඩිදුරටත් කියා සිටී. කෙසේ වෙතත් මෙම නිවේදනය ප්‍රකාශයට පත් වීමත් සමඟ අද (23) පෙරවරුවේ දී DFCC බැංකුවේ කොටසක් ගනුදෙනු මිල පෙර දිනයට සාපේක්ෂව 6.85% කින් පහළ ගොස් තිබිණි. එහිදී කොටසක මිල රු. 83.00 ක් ලෙසින් සටහන් වූ අතර එය පූර්ව දිනයට වඩා රු. 6.10 ක අඩු වීමකි. “This is part of a larger temporary cargo transfer initiative that promotes Sri Lanka's efforts to become a regional hub for logistics and commerce,” the statement said. “Sri Lanka's leaders have outlined their vision for the country’s regional engagement that reflects its location at the nexus of the Indo-Pacific and seizes the opportunities that this unique position presents,” said U.S. Ambassador Alaina B. Teplitz. 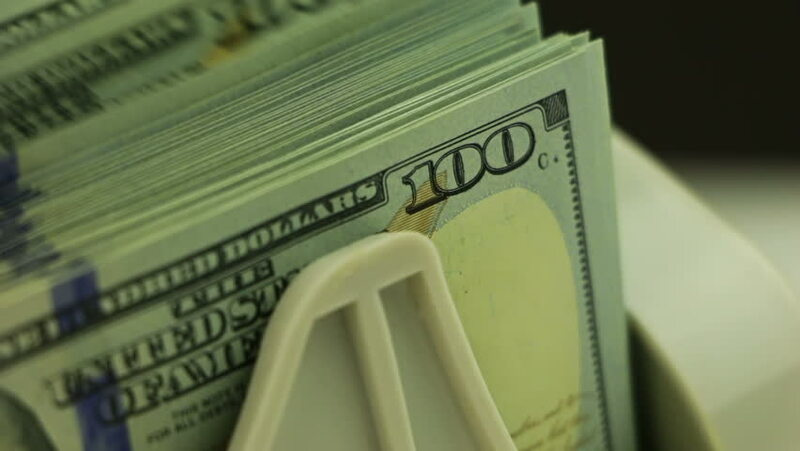 Sri Lanka's rupee was quoted at 181.50/70 to the US dollar in the spot market in mid-morning trade Monday, while bond markets were flat, dealers said. The rupee closed at 182.60/65 levels to the US dollar Friday, dealers said. Bond were quoted mostly around the levels seen at closing time Friday, with active trading yet to start, dealers said. A bond maturing on 15.12.2021 was quoted at 10.85/95 around Friday's level. A bond maturing on 15.12.2023, was quoted at 11.35/45 percent. A 7-year bond maturing 01.08.2016 was quoted at 11.52/62 percent. A bond maturing on 01.06.2026 was quoted at 11.55/65 percent. A bond maturing on 01.09.2028 was quoted at 11.58/68 percent. 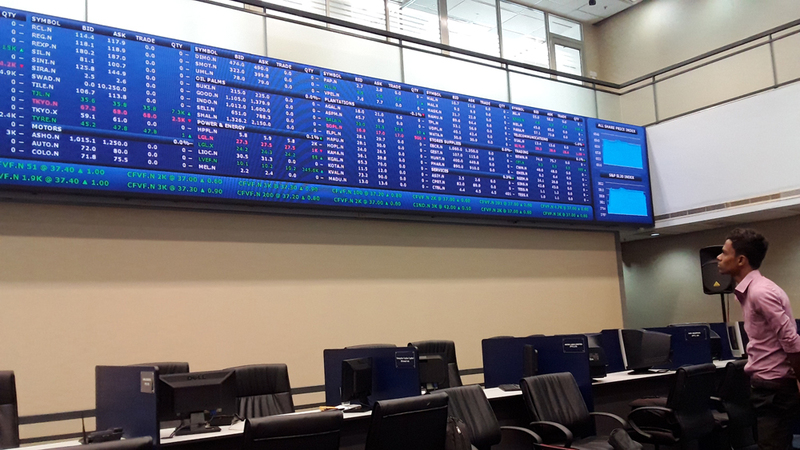 At the Colombo Stock Exchange, the All Share Price Index was down 0.05 percent or 3.06 points to 5975.24 in the first half hour of trading compared to Friday's close. The more liquid stocks in the S&P SL20 Index were up 0.44 percent or 13.32 points to 3059.55. Market turnover was 23.5 million rupees. Lanka IOC stock was down 1 rupee to 22.00 rupees, while HVA Foods was down 10 cents to 4.40 rupees, and Cargills Ceylon was down 3.70 rupees to 200 rupees. Stocks of plantation companies were also down after getting hit by higher minimum wages. 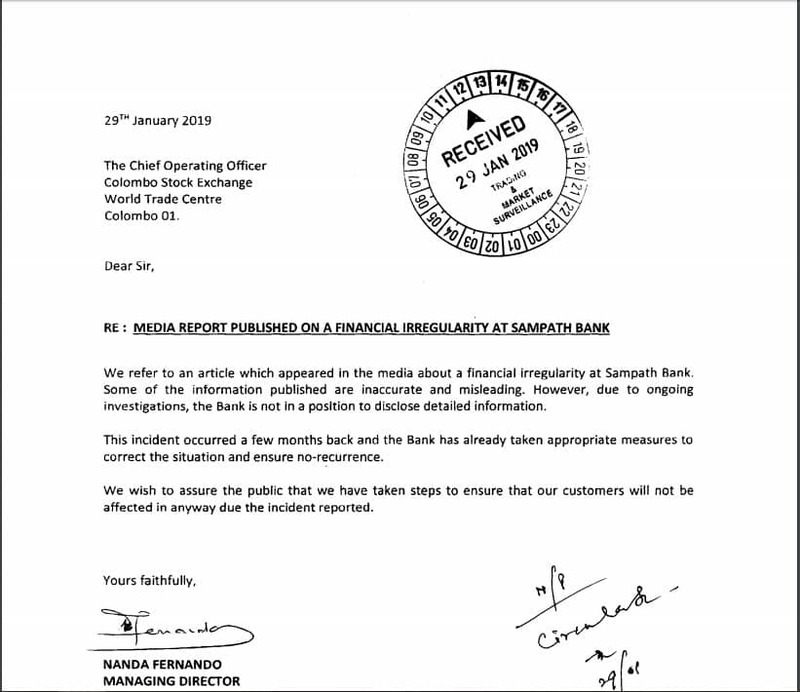 Massive Fraud At Sampath Bank. Restrictions and depreciation have triggered imports to report first ever decline in 17 months in November and help significantly narrow the trade deficit with exports improving by a modest 4.1%. The Central Bank said yesterday expenditure on merchandise imports declined by 9.1% (year-on-year) for the first time since June 2017 to $ 1.76 billion in November 2018. “The decline in consumer and investment goods contributed to the decline reflecting mainly the impact of restrictions on personal vehicles and non-essential consumer goods imports, while the relatively larger depreciation of the rupee may also have contributed to curtailing imports,” the Bank added. Earnings from merchandise exports increased moderately by 4.1% (year-on-year) to $ 980 million in November 2018. The growth in exports was driven by industrial exports while agricultural exports continued to decline. The twin development saw trade deficit narrow significantly in November to $ 785 million as against $ 999 million a year earlier. Exports in the first 11 months grew by 5% to $ 10.85 billion whilst imports were up 8.3% to $ 20.5 billion, resulting in the cumulative deficit expanding to $ 9.64 billion in comparison to $ 8.59 billion in the corresponding period of 2017. 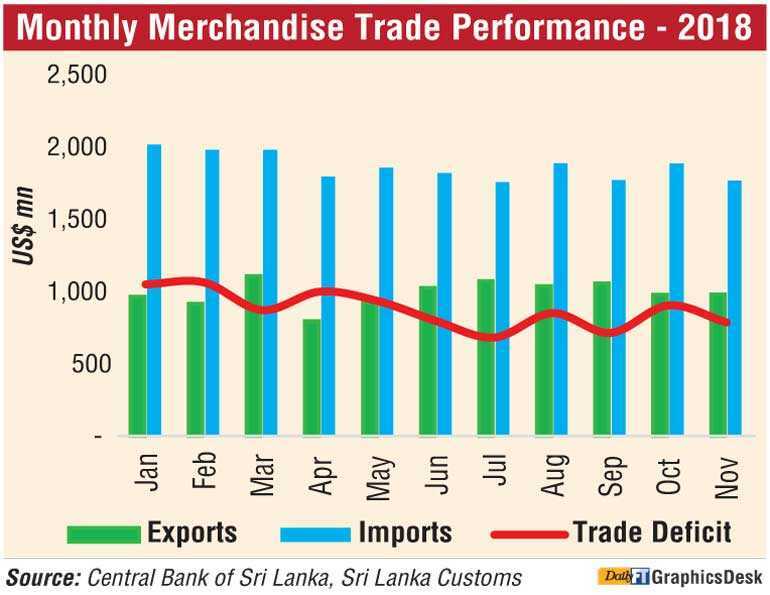 Terms of trade, which represents the relative price of imports in terms of exports, improved by 1.6% (year-on-year) to 112.8 index points in November 2018 due to an increase of export prices supported by a marginal decline in import prices. In November under industrial exports, export earnings from textiles and garments increased notably in November 2018 mainly driven by exports to the USA. In addition, garment exports to non-traditional markets such as India, Canada and Australia as well as the EU market increased along with textile and other made up textile articles. Earnings from petroleum products increased significantly in November 2018 reflecting higher bunker and aviation fuel prices despite a slight reduction in export volumes in comparison to that of November 2017. Export earnings from machinery and mechanical appliances also increased substantially during November 2018 due to improved performance in all sub-categories therein. Further, export earnings from food, beverages and tobacco, rubber products and base metals and articles rose in November 2018, contributing towards the increase in industrial exports. However, export earnings from printing industry products, gems, diamonds and jewellery and leather, travel goods and footwear declined in November 2018. Earnings from agricultural exports recorded a decline during the month due to poor performance in almost all sub-categories except the categories of unmanufactured tobacco and vegetables. Reflecting lower average export prices and exported volumes, export earnings from tea declined in November 2018. Export earnings from spices also declined during the month due to the lower volumes in most categories of spices. Further, earnings from coconut exports declined due to the drop in both kernel and non-kernel products. Earnings from seafood exports also declined in November 2018 while in cumulative terms, seafood exports rose with higher exports to the EU market. The export volume index in November 2018 increased by 2.9% while the export unit value index increased by 1.1%, implying that the growth in exports was driven mainly by the increased volume, rather than the price, compared to the volume and unit value indices in November 2017. Import expenditure on consumer goods declined (year-on-year) notably in November 2018 due to lower expenditure on food and beverages driven by rice, vegetables, dairy products and sugar imports. Such reduction in imports on food and beverages can be attributed to the combined effect of lower import volumes due to higher domestic production and lower commodity prices in the international market. Expenditure on non-food consumer goods such as telecommunication devices and home appliances decreased in November 2018 on a year-on-year basis, partly due to measures taken by the Central Bank to restrict certain categories of non-essential consumer goods imports. 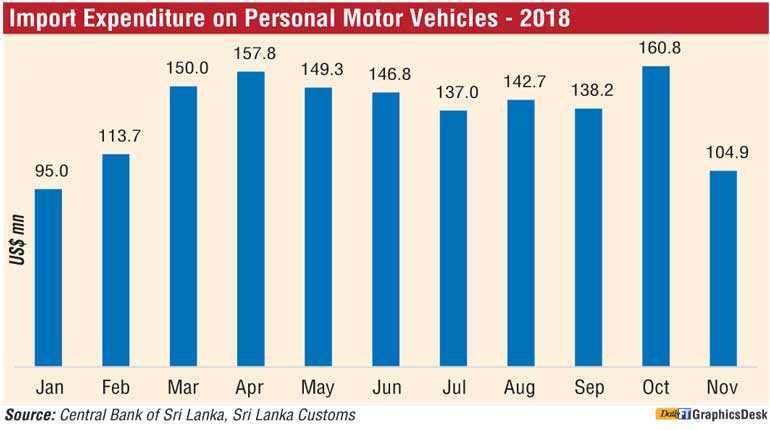 “Expenditure on personal vehicle imports showed a significant decline of 34.8% in November 2018 from the previous month, reflecting the impact of policy measures put in place to curtail personal vehicle imports. It is expected that the importation of motor vehicles and non-essential consumer goods could decelerate further in the coming months,” it said. Expenditure on the importation of investment goods also decreased in November 2018 mainly due to lower imports under many sub-categories. Specifically, a significant decline was seen in expenditure on the importation of cement and vehicles for commercial purposes compared to November 2017. In contrast, import expenditure on intermediate goods increased, albeit marginally, driven by fuel, base metals and fertiliser imports. Expenditure on fuel imports increased with the combined effect of higher import prices and volumes of both refined petroleum products and coal, despite a reduction recorded in the import volume of crude oil. Meanwhile, expenditure on base metal imports increased driven by iron and steel. However, expenditure on gold imports continued to decline significantly in November 2018, reflecting the impact of customs duty imposed on gold in April 2018. Expenditure on wheat and maize also dropped during the month mainly due to lower imported volumes. Import expenditure on mineral products and textiles and textile articles also declined during the month, contributing to mitigate the pressure on import expenditure. Both import volume and unit value indices decreased by 8.6% and 0.5%, respectively in November 2018. 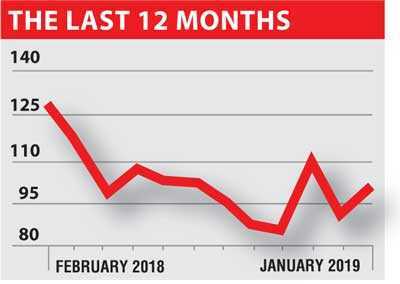 This indicates that the decline in imports during the month was driven by the reduction in volumes imported despite lower prices of imported goods in comparison to the corresponding period of 2017. The Sri Lankan spice sector is looking at expanding the sector with technological collaborations and investments following the Global Spice Road Symposium in Colombo in June. The industry sources said, the spice industry representatives envision that Sri Lanka as a main spice country and the growers and the exporters will be able to benefit through technological collaborations and knowledge sharing sessions during the symposium. The main objective of this event is to create an upheaval in the main segments of spice, namely, Agronomy, Post Harvesting, Primary Processing, Technological Intervention and Value Addition, Export and Commercials. According to the Global Spice Road Symposium Secretariat, the main challenges and constraints confronted mainly by producers and exporters will be addressed in the forum to secure a holistic approach to identify the most feasible solution. The symposium despite being a private initiative has managed to gather sufficient momentum from the government sector, mainly the endorsements from President Maithripala Sirisena and Ministry of Agriculture. Further collaboration with the main public agencies such as the Spice Council, Spice and Allied Product Producers’ and Traders’ Association, Export Agricultural Department, United Nations Food and Agricultural Organization and many academic leaders will be a part of the external committee to drive the main strategies and formation of the event towards its envisioned success. The Global Spice Road Symposium will be held at the Bandaranaike International Memorial Hall from July 10 to 13. The members of the Strategy and Planning Committee of the Global Spice Road Symposium Secretariat include Dr. Heenkende, Director General of Export Agricultural Department, Gulam Chathoor, Chairman of Saboor Chathoor Pvt Ltd, Manju Gunawardena, Chairman of The Spice Council, Prins Gunasekara, Chairman of The Spice and Allied Product Producers’ and Traders’ Association and Professor Buddhi Marambe, Chairman, Board of Study in Crop Science, Postgraduate Institute of Agriculture (PGIA), University of Peradeniya. ජෝන්සන් සහ ජෝන්සන් ට ශ්‍රී ලංකාවේ දොර වැසෙයි? ශ්‍රී ලංකාවට ජොන්සන් ඇන්ඩ් ජොන්සන් ළදරු පුයර ආනයනය, නැවත දැනුම් දෙනතුරු අත්හිටුවා ඇති බව රෝයිටර් පුවත් සේවය වාර්තා කර සිටී. ජොන්සන් ඇන්ඩ් ජොන්සන් ළදරු පුයර නිෂ්පාදිතවල, පිළිකාකාරක ඇස්බැස්ටෝස් අඩංඟු නොවන බවට තහවුරු කරන තුරු මෙම වාරණය බලපැවැත්වෙන බව එම වාර්තාවේ වැඩිදුරටත් සඳහන් වේ. ජොන්සන් ඇන්ඩ් ජොන්සන් ළදරු පුයර නිෂ්පාදිතවල පිළිකාකාරක ඇස්බැස්ටෝස් අඩංඟු බවට පසුගිය කාලයේ දී ඉන්දියාව ඇතුළු රටවල් කිහිපයකින්ම වාර්තා විය. In the latest effort to upgrade Battaramulla as the administrative capital, the Ministry of Megapolis and Western Development yesterday launched a Rs. 30 billion mixed development project in the heart of the town. The venture aims to integrate a multi-modal transport centre that plans to locate all major administrative functions in the capital with investment from Riemersma Management Company (RMC)’s Essar Project on a public-private partnership basis. The project will initiate its plans in a 415-perch land plot, with the Koswatta to Kaduwela main road running behind it and the Battaramulla to Rajagiriya main road running in front. It proposes to build two towers with 35 storeys and 26 storeys, the first allocating a net space of 20,000 square metres for government and private offices, and the latter with 250 standard apartments and 100 hotel apartments. The project will also be part of a Light Rail Transport (LRT) system which will run from Kaduwela to Fort. In addition, the apartments will be priced targeting the employees in the area. The entire project is expected to be completed within the next five years. “This mix development project, which was launched as a public-private partnership project, is an important milestone project for our Ministry. This project proposes to locate all major administrative functions within municipalities of Kaduwela, Sri Jayawardenapura Kotte, Urban Council of Maharagama, and Pradeshiya Sabha of Kotikawatta-Mulleriyawa, and integrate these identified areas of the administrative capital, and gazette and declare it as separate Municipal Council in the future,” the Minister of Megapolis and Western Development Patali Champika Ranawaka stated at the launch. The lease declaration for the land plot, which was leased to Essar Project for a 99-year lease for Rs. 1.4 billion, was handed to the investors at the launch by the dignitaries. Speaking at the launch, RMC’s Essar Project Managing Partner Kier Riemersma voiced their gratitude for the opportunity given to participate in the development of Sri Lanka and detailed the plans the project holds. “The most important aspect of this project in our perspective is the job creation and the economic development. We have long looked at Sri Lanka as a strong area for foreign direct investment. This project is the first step in that process,” he stated. Speaking to Daily FT, Riemersma said the time frame for this development will be three and a half years with 12 months of design and engineering, which will be followed by the construction cycle of two and a half years. He explained that they are the development manager of this development project. “We oversee the entire project, which includes putting the investment consortium together, procuring the design team, the engineering team, the construction company, the hotel operator as well as sales, leasing, and management for the project,” he added. The project declaration of investment for the lease was handed over by the Minister of Megapolis and Western Development to the investors at the ceremony. The Minister of Development Strategies and International Trade Malik Samarawickrama, Ministry of Megapolis and Western Development Secretary Eng. Nihal Rupasinghe, Ministry of Megapolis and Western Development Administrative Cities Development Project Director Srimantha Fernando, and other Ministry officials were present at the event. To ensure the independence of every citizen, they must have economic independence in every segment of society, University of Colombo Emeritus Professor of Sociology Prof. Siri Hettige said recently. Addressing a public forum on Sri Lanka’s independence last Tuesday and how it can be improved at the Centre for Society and Religion (CSR) organised by the Democratic Social Alliance, he said an individual could not be independent with an unstable economic background and such an individual would constantly struggle to economically stabilise himself. “If people are hampered by debt and live in an unstable economic situation, we cannot call that particular person an independent individual,” he said. He pointed out Sri Lankan citizens had to face challenges such as traffic congestion and an inadequate healthcare service, which raised questions about the independence of the citizens of Sri Lanka. Prof. Hettige noted that due to ever-increasing economic challenges, uncertainty had arisen over the happiness and self-fulfilment of the citizens of the country. Prof. Hettige pointed out Sri Lanka had recently experienced internal migration from rural areas to urban and this trend should be taken into consideration when making policy adjustments to attain economic goals. He noted the driving force of the internal migration was economic independence and job opportunities in the urban sector of the economy. Prof. Hettige argued that Sri Lankans had been facing economic challenges due to the lack of industrial diversification and export-oriented industries. “When we consider the industrial sector, we do not produce most of the essential household goods. Therefore, we have to rely on imported industrial goods,” he added. He said Sri Lanka had to break free from relying on the apparel sector as the only industrial product that has been successfully produced throughout the country’s history. “We need to have a balance between the main three segments of the economy. We mostly rely on remittances to resolve issues pertaining to the trade deficit, but that has to be changed if we want to move forward,” he added. Prof. Hettige raised concern over the lack of the research and development in Sri Lanka. He pointed out that investing in research and development would open more opportunities for Sri Lanka to develop its economy. “Sri Lanka allocates a very small proportion of GDP for research and innovation. Therefore we have to increase the allocation to encourage research and development for new industries,” he said. Sri Lankan banks have high credit risks due to slow economic growth, high credit growth and lax lending standards, ratings agency Standard & Poor (S&P) said in a report. "The Sri Lankan banking sector's resilience is weak and is affected by the country's low income levels, with an estimated per capita gross domestic product of about US$4,050 in 2018," it said. "Credit risk is high, in our opinion, given relaxed lending and underwriting standards as well as evolving risk management practices," S&P said. "The credit risk is accentuated by high growth in credit in the past and a recent slowdown in GDP growth." Bad loans increased to 3.6 percent of total loans in September 2018 from 2.5 percent at the start of 2018. Weather disruptions which affected agriculture and related industries, along with bank's aggressive growth increased bad loans, S&P said. The ratings agency is expecting bad loans to grow and remain around 4.5-5 percent of total loans over the next 12-18 months due to slower economic growth. S&P said local banking regulations and supervision is lower than international standards. Disclosures by banks are low but improving, it said. However, industry risk is stable, S&P said. The Government has increased the import tax on one kilogram of potatoes by Rs. 30 whilst increasing the import levy on one kilogram of maize by Rs. 20. Accordingly, the total import levy imposed on a kilogram of potatoes is Rs. 50, while that of a kilogram of maize is Rs. 20. Minister of Agriculture P. Harrison said the levy on imported potatoes was increased to help the local farmer as potato crops from Jaffna and other districts will enter the market soon. Ceylon Guardian Investment Trust and Ceylon Investment have announced they are considering winding up The Sri Lanka Fund, based in the Cayman Islands tax haven, whose aim was to attract foreign investments to the island. The two firms hold 43.34 percent each of the dollar denominated fund, managed by Guardian Fund Management Limited. The Cayman Islands is considered a leading location for investment funds, estimated to house more than two-thirds of the world’s offshore hedge funds and nearly half of the industry’s estimated US$1.1 trillion of assets under management. The stock exchange filing said The Sri Lanka Fund, an open-ended fund started in October 1993, was re-launched in August 2010 under the management of Guardian Fund Management Limited to attract foreign investors to the Colombo Stock Exchange. The fund size was given as 2.23 million US dollars as at end-August 2018. The top holdings were Cargills, Hatton National Bank, Ceylinco Insurance, Nations Trust Bank and Dialog Axiata. About 43 percent of the fund was invested in the Colombo Stock Exchange’s banking, finance and insurance sector with 14.4 percent in conglomerates and 11 percent in the food, beverage and tobacco sectors. As the fund is registered in Cayman Islands, which is a tax haven, capital gains and dividend income are not taxed. The Government moved the Appropriation Bill 2019 yesterday in Parliament, seeking House approval to raise and spend Rs. 4.47 trillion during the year. The motion seeks permission to meet capital as well as recurrent expenses of the Government, setting the borrowings limit at Rs. 2.16 trillion. The highest recurrent allocation of Rs. 393 billion is for the Ministry of Defence and the lowest of Rs. 185 million to the Non-Cabinet Ministry of Public Distribution and Economic Reforms. The Ministry of Education will receive Rs. 105 billion. The Highways and Road Development and Petroleum Resources Development Ministry has been allocated Rs. 176 billion, Health Ministry Rs. 187 billion, Agriculture Ministry Rs. 114 billion, Education Ministry Rs. 105 billion, Public Administration and Disaster Management Rs.263 billion, Provincial Councils and Local Government Ministry Rs. 292 billion, Megapolis and Western Development Ministry Rs. 50 billion and City Planning and Water Supply Rs. 127 billion. The President’s Office has been given Rs. 14 billion, which is Rs. 3 billion higher than in 2018. The Prime Minister’s Office has remained the same, given an allocation of Rs. 2 billion, but the allocation for National Policies and Economic Affairs Ministry has been given a significant hike from Rs. 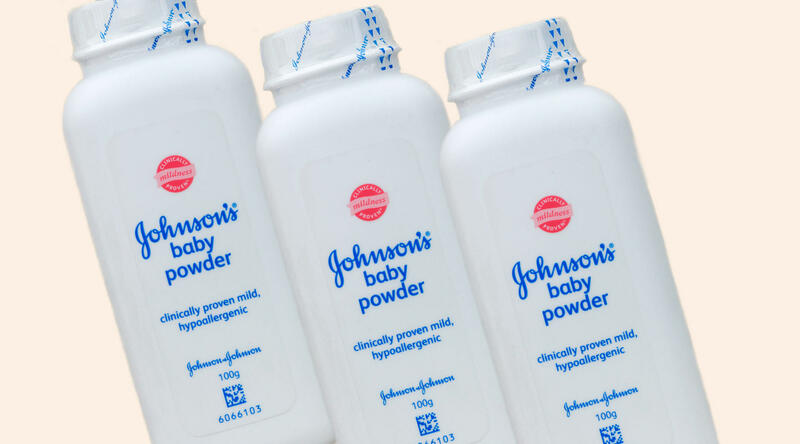 25 billion in 2018 to Rs. 98 billion in the latest Appropriation Bill. The Finance and Media Ministry was given Rs. 89 billion, which is a reduction from Rs. 95 billion from last year. Accordingly, this year’s annual State expenditure will be Rs. 4.5 trillion and State revenue Rs. 2.4 trillion. State revenue which was 11.5% of GDP in 2014 has gradually increased after the Coalition Government came into power and is expected to be raised to 15.12% of GDP in 2019. The National Budget for 2019 will be prepared under the Medium Term Fiscal Framework (MTFF) by adopting the performance-based budgeting approach with the aim of strengthening the ongoing fiscal consolidation programs, the statement added. The Government is also aiming to achieve the target of increasing State revenue to 17% and limiting recurrent expenditure to 15% of GDP by 2021. Finance Minister Samaraweera’s second Budget will have some ambitious targets including maintaining the debt to GDP ratio to just 70% and limiting recurrent expenditure to 15% of GDP. Capital expenditure will also be limited to only 3.5% of GDP. Sri Lanka’s debt to GDP ratios are likely to be closer to 80% as the Government will have to borrow to repay about $ 2.9 billion in 2019. Ratings agencies had earlier indicated that Sri Lanka’s debt to GDP ratios will remain higher than its peers in the short term as high debt repayments are likely to continue till 2022. Currently Sri Lanka’s debt to GDP is about 78%, according to the Central Bank. The Appropriation Bill will be presented to Parliament by Finance Minister Mangala Samaraweera on 5 February and the Budget will be presented on 5 March. After the third reading the Budget vote will be taken on 4 April. The Appropriation Bill 2019, gazetted on 11 January to provide for the service of the financial year 2019, seeks passage to authorise the raising of loans in or outside Sri Lanka, for the purpose of such service; to make financial provision in respect of certain activities of the Government during that financial year; to enable the payment by way of advances out of the Consolidated Fund or any other fund or monies of or at the disposal of the Government, of monies required during that financial year for expenditure on such activities; to provide for the refund of such monies to the Consolidated Fund and to make provision for matters connected therewith. The LMD-Nielsen Business Confidence Index (BCI) climbed 11 notches to register 101 in January, according to the latest edition of LMD. 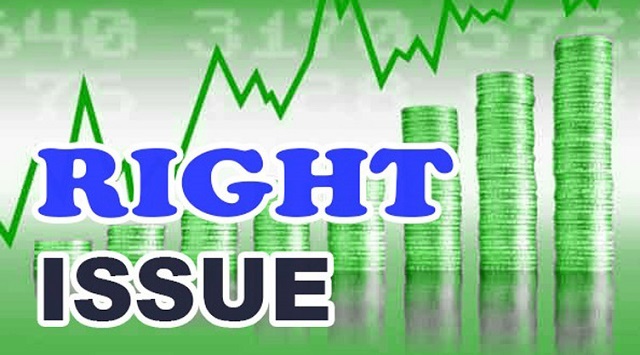 LMD reports that the economy, politics and corruption are considered to be among the main concerns for the nation. Meanwhile, the value of the rupee and inflation are the notable sensitivities in corporate circles. “Sri Lanka is currently in a debt trap and the depreciation of the rupee is pushing the country further into debt. The authorities should act first on strengthening the value of the rupee; or else the economy will be adversely impacted,” observes one corporate executive. Media Services says the latest edition of the magazine will be released to leading bookstores and supermarkets on 8 February (for the full BCI report, visit www.LMD.lk). කොළඹ කොටස් වෙළෙඳපොළේ ලැයිස්තුගත මූල්‍ය සමාගම් දෙකක් වන ද ෆිනෑන්ස් කම්පැනි පීඑල්සී හා පීපල්ස් මර්චන්ට් ෆිනෑන්ස් පීඑල්සී යන සමාගමේ දෙකෙහි කොටස් ගනුදෙනු 2019 පෙබරවාරි 07 දින සිට අත්හිටුවීමට තීරණය කර ඇති බව කොළඹ කොටස් වෙළෙඳපොළ දැනුම් දී සිටී. 2018 මාර්තු 31 න් අවසන් වර්ෂය සඳහා වන මූල්‍ය වාර්තාවෙහි වෙනස් කරන ලද ස්වාධීන විගණන වාර්තාව ඉදිරිපත් නොකිරීම, ද ෆිනෑන්ස් සමාගමේ කොටස් ගනුදෙනු අත්හිටුවීමට හේතු වී තිබේ. මේ අතර නියමිත ආයතනික පාලන අවශ්‍යතා සපුරාලීමට අපොහොසත් වීම පීපල්ස් මර්චන්ට් ෆිනෑන්ස් සමාගමේ කොටස් ගනුදෙනු තහනම් කිරීමට හේතු වී ඇති බව කොළඹ කොටස් වෙළෙඳපොළ දැනුම් දී සිටී. මෙහිදී කොළඹ කොටස් වෙළෙඳපොළ වැඩිදුරටත් කියා සිටින්නේ 2019 පෙබරවාරි 15 දිනට පෙර අදාළ අවශ්‍යතා සපුරාලීමට මෙම සමාගම් අපොහොසත් වන්නේ නම් 2018 පෙබරවාරි 19 දින සිට මෙම සමාගම්වල කොටස් ගනුදෙනු අත්හිටවනු ලබන බවයි.